We’d love your help. Let us know what’s wrong with this preview of The Piper's Price by Audrey Greathouse. Peter is plotting his retaliation against the latest bombing. Neverland needs an army, and Peter Pan is certain children will join him once they know what is at stake. The lost boys and girls are planning an invasion in suburbia to recruit, but in order to deliver their message, they will need the help of an old and dangerous associate — the infamous Pied Piper. Hunting h Peter is plotting his retaliation against the latest bombing. Neverland needs an army, and Peter Pan is certain children will join him once they know what is at stake. The lost boys and girls are planning an invasion in suburbia to recruit, but in order to deliver their message, they will need the help of an old and dangerous associate — the infamous Pied Piper. Published February 21st 2017 by Clean Teen Publishing, Inc.
To ask other readers questions about The Piper's Price, please sign up. is this a duology or is there going to be more books? This book takes the second star on the right and launches into adventure pure with whimsical, childhood imagination straight on till morning. If the adults from the normal world aren't stopped, Neverland will be destroyed. Peter Pan already has a plan, but it involves a deal with the notorious Piper. Gwen is ready to help Peter even if being sixteen already makes it hard for her to play in the Lost Kids' childhood games. But nothing is as it appears, and Gwen soon wonders if she's in over her hea This book takes the second star on the right and launches into adventure pure with whimsical, childhood imagination straight on till morning. If the adults from the normal world aren't stopped, Neverland will be destroyed. Peter Pan already has a plan, but it involves a deal with the notorious Piper. Gwen is ready to help Peter even if being sixteen already makes it hard for her to play in the Lost Kids' childhood games. But nothing is as it appears, and Gwen soon wonders if she's in over her head. This is a book for the young at heart. I did read the first one in the series, so the writing style and flow wasn't a surprise. The author masterfully weaves child like tendencies with an emerging adult, creating the perfect world for a coming of age story. The first pages appear to be written for a younger audience, but as the story progresses, it hits the inner struggles of growing up head on. The imagery is a real treat. Neverland comes to life with all the quirkiness and ease of the original tale. The Lost Kids are ready to play every game, and even when the going gets tough, they keep it all in the realm of play. The only character that comes across a little more clever with his years of experience is Pan. He's still a child at heart and belongs fully to Neverland, but there is a wonderful wisdom in all that he does which, at times, puts him beyond his years. It's an intriguing mixture which makes this Peter a sheer delight. The plot moves along with imagination, fairy dust and magic. Adventures flow, one right after the other, and there are tons of twists and turns. The tension stays high even when the light-heartedness never fades. Some things fit logically well together. Others do not. But in Neverland, imagination rules so these holes don't bother in the least. Gwen has a bit of a romance going, which doesn't come across quite as natural as it could and, for me, fell a little short. The word 'love' falls, but it doesn't seem to click with the fly-by-night meetings she has with her heart-throb. Summed up, this is a wonderful read fairy tale friends, and especially those of Peter Pan, are sure to enjoy. It's comes across a bit young for YA at times, but that what Neverland is all about. I'm giving this 4.5 stars and am rounding up. I'm definitely excited to see where the epic battle for this land will go next. I was given an e-copy of the Piper's Price by the author in exchange for an honest review. The Piper's Price is the second book in the Neverland Wars series. It picks up a few months after the end of the first book, where Gwen and her sister, Rosemary, fled reality and the black coats of the Anomalous Activity Department, who intend to strip down Neverland's magic and use it for their own purposes. 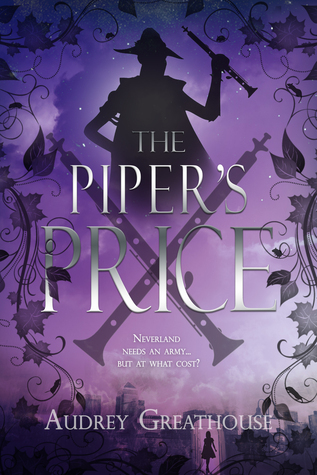 In order for Peter to recruit an army of children to protect Neverland, Gwen must return to realit I was given an e-copy of the Piper's Price by the author in exchange for an honest review. Four stars only because I had trouble getting into it. But once I was in, it was fun, whimsy, creative, and just plain imaginative. The characters really stand out in this one, even more than in the last, and the author's voice is more defined. I'm still not completely head over heels for Jay, but I'm more on that ship than I was last book. Overall, a great followup to The Neverland Wars. Peter Pan must save Neverland! Grown ups in Reality have upped their game, and these are no longer idle threats. The War is near, and Peter cannot win it without more children. In order to gain the following Neverland needs, Peter needs the Piper’s help. Except they are nearly arch enemies. Then there’s the problem of some puzzling tokens that must be found to summon the Piper. Since Peter can’t go himself, he sends Gwen back to Reality to hide with an old Native American friend. Peter’s perfect pairing is no surprise – Tiger Lily will help Gwen along the way and keep her safe from the Anomalous Activity Department. While gathering intel, Gwen is reunited with a friend of her own. Once returning to Reality, Gwen has no one besides Tiger Lily. Except there’s Jay – the boy she is crushing on – and whose party she literally vanished from at the end of the first book. He can keep a secret, but her magic might give her away. Gwen also meets an interesting group of ladies while waiting for her moment to meet and lure the dangerous Pied Piper into Peter’s plan. Once it arrives, Gwen is thrown for quite a loop. Luring the Piper is much more difficult than she ever imagined – and the stakes are high. Plot. Unlike the first book that had an unclear plot line, there is a clear and strong plot that pulls in many characters and presents new situations and new information for readers that continue to make the war Peter is fighting more real. This book picks up a short time after the end of the first book when Gwen and her sister fled Jay’s party with the black coats of the Anomalous Activity Department on their heels. They want to strip Neverland of magic forever. The bombings are becoming more frequent and dangerous in Neverland. Overarching Conflict. To preserve Neverland and prevent the grown-ups in Reality from stealing Neverland’s magic, Peter needs to recruit an army of children. For once, Peter has a plan. Unfortunately, it involves dealing with the devil: the Piper. Peter and Gwen must solve a riddle and bring the required tokens for the Piper to appear. Solving the riddles proves quite difficult and requires the help of others. Lasiandra. The blonde-haired mermaid is more than meets the eye. While mermaids are not to be trusted, she somehow gains a glimmer of trust from Gwen. She and Gwen develop a friendship that is mutually beneficial. While Lasiandra is helping Gwen in the short term, she will reap her rewards in the long run. She provides Gwen with important information and also gifts her a mermaid scale for future use to call her when Gwen should need her. Gwen’s Dilemmas. Gwen experiences a series of dilemmas throughout this installment. It made her more real and believable as a character. First of them all is the fact that Gwen is now 16 – the oldest of the Lost Boys of Neverland. For her, it is harder to engage in Neverland. In fact, she is losing the ability to fly. It is becoming cumbersome to play along with the Lost Boys and their games. Then there is the fact that Peter sends her away – back to reality, hiding out in Tiger Lily’s trailer. While Peter claims she is helping and doing the important work to finding the Piper, Gwen can’t help but wonder why Peter wanted to send her away from Neverland. Was she the right person for this job? Was this mission even real? Does Peter trust her? Is he going to follow through? Her doubts are real and even more real for a teenage girl. She doesn’t feel that she belongs in either place – Neverland or Reality. Tiger Lily. Who knew she’d been living in Reality all this time? She is living as an actual Native American, leading a relatively quiet life. Apparently she, along with her friends (princesses? ), were part of the MRP, Magic Relocation Program, and have denounced all things magic since. Most of them want nothing to do with magic – or Peter – anymore after all these years. Tiger Lily and her friend Dawn are the most helpful to Gwen. While Gwen hides out at Tiger Lily’s, she acts sort of like a surrogate parent, but more like an older, wiser friend. And she’s the only one who openly will help Peter, causing me to question what Peter had done in the past to these Neverland migrants. Peter. Again Peter seemed one-dimensional and elusive. I was expecting him to have greater exposure in this book and to show character growth. The closest he came was his reassurance to Gwen about choosing and trusting her above all. The Piper. He is revered as notorious and sinister. After solving the token riddles and presenting the Piper with them, Gwen soon finds she is in over her head. Acquiring the Piper’s assistance is not as easy as handing over a pirate patch and other baubles. His price is much higher: the crown of Princess Charlotte of Wales, a root cutting from the Never Tree, and of course his pipe. Ultimately, the Piper wants to be finished with the mermaids, whose magic can always find him thanks to the stars. So he needs something more powerful than them from Neverland – the Never Tree cutting. It could be the most damaging thing of all to Neverland. Jay. I thought we saw the last of Jay when Gwen fled his party at the end of the first book, but her crush on him seems to have a hold over her. While contacting him at all was extremely risky, Jay seemingly knows how to keep secrets – and big ones. I found it hard to believe that he wouldn’t spill the beans and give away her presence – especially to her parents – but I suppose that shows the distance and disconnect they had before she disappeared. What did Jay really know about Gwen anyway? They obviously weren’t that close. I did find it ironic though, that Gwen was the one with the crush on him, but anytime she told him to jump, he asked how high…or rather, what hour of the night and which remote location to meet at. There was more to Jay, though. He actually listened to and supported Gwen, unlike her parents or even Peter. Disclaimer: I received a copy from the author for review. Thank you! This series and I have had a rocky relationship. It's a shame. I like the concept, the cover art, and the fact that it's a retelling, but the content just hasn't clicked for me. Most, if not all, of the issues I had with Book 1 are present in The Piper's Price. Gwen continues to fill too many pages with unresolved teenage angst and an identity crisis. The book itself seems to suffer an identity crisis of sorts, featuring a protag Disclaimer: I received a copy from the author for review. Thank you! Most, if not all, of the issues I had with Book 1 are present in The Piper's Price. Gwen continues to fill too many pages with unresolved teenage angst and an identity crisis. The book itself seems to suffer an identity crisis of sorts, featuring a protagonist who often comes across as much, much younger than 11th grade and a story that might make more sense as a middle grade novel (minus the brief moments of obscenity-filled teenager-dom). The writing style remains awkward to my ear and full of telling instead of showing; and the plot meanders toward an incomplete conclusion with several tangents I hoped would develop into something meaningful, but didn't. This book also featured a romance for Gwen that gave rise to even more angsty internal monologuing and little character development. This review has been hidden because it contains spoilers. To view it, click here. Gwen and Peter ate back in Neverland. The grown-ups are sending attacks in and effort to capture Neverland's magic including the fairies. Peter has the solution though. He needs more children and fast. The only person who can get the job done is the Piped Piper. The story is good. However, I went into it thinking that the Piper would be a bigger part of the book but he only has a few scenes. There are a couple of other characters added in one scene that I wish more of the background was explained Gwen and Peter ate back in Neverland. The grown-ups are sending attacks in and effort to capture Neverland's magic including the fairies. Peter has the solution though. He needs more children and fast. The only person who can get the job done is the Piped Piper. The story is good. However, I went into it thinking that the Piper would be a bigger part of the book but he only has a few scenes. There are a couple of other characters added in one scene that I wish more of the background was explained and nit just thrown in for the purpose of that one scene. Overall, it is a good story but with a slower pace. If you read the first book you're likely to like this book. And it is a must read if you plan on continuing the series as I don't think we heard the end of the Piper. I really struggled to rate this eBook. I suspect it might have got a higher rating if I'd not been reading it in dribs and drabs between doing other things. That said, I am enjoying it. I am particularly appreciating that the YA "love story" is unfolding at a more realistic pace than most books I have read in a similar genre. At times, I do find Gwen's observations a lot more adult than her age would suggest, but I guess that's also quite common with YA novels. This edition felt longer than the typical "YA eBook series" installment which was nice. Often I find these series feel more like one book chopped up into a collection of chapters rather than a series of stand-alone books. Gah I just love this retelling of Peter Pan! I think I preferred the first book but the second has me so excited for the conclusion I can't even. There's less Neverland in this one which is probably why I felt it dragged just a little at some points but it's a great book for further exploring Gwen's character. I love how different this retelling is by swinging it into YA - AND THE COVERS ARE GORGEOUS. This the second book in this series and it’s a retelling of Peter Pan!! So if you haven’t read the first book then leave!! Spoilers ahead for book one! The Piper’s Price picks up from the events of the first book and we’re still following Gwen as she’s at an awkward age to be in Neverland but determined to stick with her sister — and with Peter, who she obviously is more than a little fond of — and fight against the adults that are ruining Neverland with their abuse of magic. So the plot of the sequel is Gwen trying to get in contact with the Piper to get him on their side of the war to try and save Neverland before the magic runs out. But he’s a tricky fellow and demands several things of Gwen before he’ll co-operate. Most of the book follows Gwen as she tries to meet this criteria. We get to meet a few new characters in this book, such as the Piper and also Tiger Lily. But most of the book takes place outside of Neverland and is much slower paced, or maybe the better way to describe it is that it just less exciting than the first one. I can’t deny I was ever so slightly disappointed overall but I still enjoyed it, and I’m hoping the third book will round things up wonderfully! So let’s discuss these indecisive feelings a bit further. I’m all for retellings of classics, I love seeing someone do something new with the story. My favourite thing about what Greathouse has done with this series is making Peter older and introducing a love interest (we think). I love that Gwen is at an odd age and so we’re seeing Neverland from a curious perspective — and I love the story of the magic and the war against reality. But everything is moving much too slow for me. I’m not sure what to think about love interests anymore because our lover boy from book one — the guy from school, Jay — is back in this book. And Peter is fairly elusive, so are we shipping Gwan (can that be the ship?) or not? Spoilers:(view spoiler)[I’ve always been an on-the-fence person when it comes to the classic character of Peter, himself. He’s childish in all the bad ways, selfish and pesky. The more I re-watch Disney’s take on it, the less I like him. I thought that Greathouse was steering away from his odd character complexities but this sequel has me doubting. Peter is just not there and I want him to be. I mean, I get that the book is playing on Gwen’s insecurities hence her flight issues and hence her lapse into wanting to be in reality again — she’s clearly not fitting well into the whimsical ways of Neverland. It's like his position as "leader" of the lost children has made him too important to do any of the dirty work any more. I think he might be there more in the next book, but who knows? So much of this sequel is based in reality which means it’s all about Gwen and her life — her relationship issues and her frustrating inability to fly properly. And I think this was my main let down of the book: it wasn’t magical enough for what I was expecting. I wasn’t sure what to expect of the Piper but his story was alright — I particularly loved the final “battle” scene with all the children in reality being given fairy dust. I guess the bottom line is that this was too slow, but I still enjoyed it. An interesting sequel to the first book, indeed!! I’m crossing everything that the third book takes us out with a bang — and I can’t wait to see our fantastic mis-match of character battling it out against reality together. I hope that Gwen pulls herself together more so that she can have it straight in her head whose side she’s actually on and I hope to god Peter is upfront and centre in book three. I guess we’ll see. Great second book. Really enjoying this series. It's a fun weekend or vacation read. It brings about some light social issues and is highly relatable in terms of the way we all have felt caught between clinging to childhood and being forced to grow up. It provides interesting perspective on these fronts. Looking forward to the final installment. Much better than the first. So glad I read it. Can't wait to see what book three brings. Great book, I really love the new concept of Neverland that Audrey Greathouse has come up with. Gwen is back in Neverland with her sister Rosemary. They are preparing to help Peter build an army to fight the adults who want to take over Neverland. To do this Peter needs Gwen's help to find the Piper. Gwen goes back to reality to do the task she is given by Peter. With much at stake, they try to stay under the radar always in danger of being caught by the Black suits. Sacrifices are made will it be enough to stop the adults from taking over Neverland? In an Oyster Shell - A stellar second in Gwen is back in Neverland with her sister Rosemary. They are preparing to help Peter build an army to fight the adults who want to take over Neverland. To do this Peter needs Gwen's help to find the Piper. Gwen goes back to reality to do the task she is given by Peter. With much at stake, they try to stay under the radar always in danger of being caught by the Black suits. Sacrifices are made will it be enough to stop the adults from taking over Neverland? In an Oyster Shell - A stellar second installment in the Neverland Wars. The Pearls - The retelling is still really good in this second book. I would dare to say even better. I feel like this second book is more established. It feels like the author really found her rhythm in this book. I really enjoyed it. I enjoyed the contrast between Neverland and the characters who are forced to live in reality. The characters are what make this story. Gwen being a teenager is a huge cornerstone to this story. Being older than the kids she has some maturity that helps. It also is interesting that her maturity also can hinder her and the missions at times. Sometimes her younger sister Rosemary takes on the "big" sister role. It's an interesting twist. Peter is one of the best-developed characters I've come across. There are attributes that you expect from Peter Pan and others that you would not. He is a complicated and interesting character that keeps you turning the pages. The Sand - The ending was a little less than satisfying, but there is another book to look forward to, so it wasn't a big deal. Pipers Price picks up a couple of weeks after the first book left off; Gwen is back in Neverland and is collaborating with Peter and the Lost Boys in an effort to save Neverland once and for all from those in reality who are after it's magic. They have devised a plan to locate the Piper in an effort to (hopefully) garner his support and help in preparing for a final showdown with the grownups for the magic contained in Neverland. Gwen is tasked I received this book as an ARC for an honest review. *Thank you to the author, Audrey Greathouse, for sending me a free digital copy of this book in exchange for an honest review. I still wasn’t a fan of Gwen as the protagonist. I could definitely do without her. I felt as though she didn’t know what *Thank you to the author, Audrey Greathouse, for sending me a free digital copy of this book in exchange for an honest review. The gang is all back in this sequel of the Peter Pan retelling, "The Neverland Wars" by Audrey Greathouse. In "The Piper's Price" we rejoin Gwen and Peter as they try and find a way to contact the Piper and get his help to recruit children in order to save Neverland. After the ending from the first book that left me hanging, I was happy to be back in this world and find out what had happened with Gwen and Peter. It was enjoyable to find out all of the answers to the questions I had swimming around The gang is all back in this sequel of the Peter Pan retelling, "The Neverland Wars" by Audrey Greathouse. After the ending from the first book that left me hanging, I was happy to be back in this world and find out what had happened with Gwen and Peter. It was enjoyable to find out all of the answers to the questions I had swimming around in my mind after reading "The Neverland Wars". As much as I enjoyed the first book, I must say, that I enjoyed this one a bit more. There was a lot more action, especially in the second half of the book. I also got to see more of Peter and Gwen's personality. I loved seeing how loyal Peter was to his friends and how committed to his cause that he is. I also loved seeing Gwen grow through her experiences and to see how much she loved her sister and would do anything for her. As an adult reading this book I can understand how heartbreaking it can be for an adult to lose a child to Peter. It is understandable why an adult would not want that child to leave for Neverland. However, at the same time I can see the appeal in being whisked away to Neverland to have fun playing with Peter and the other children. It was fun to go on this adventure with them through the eyes of Gwen. If I were a child and Peter came knocking on my window, would I go off with him? You bet! I can't wait to get the third book in my hands so I can see what other adventures await for Peter and the other children. If you loved the first book, or even if you didn't, I would highly recommend giving this book a read. You can find my review at www.readinglark.blogspot.com after 21 Feb 2017. The Piper’s Price continues all of the best elements of The Neverland Wars with an added layer of sophistication. The plot is just as fun and engaging, and Greathouse manages to craft more nuance into the story’s themes. In this book, we continue to track Gwen’s struggle with growing up as she’s torn between her desire to stay in Neverland and her draw to the adult world. She struggles with regular issues like boys and relationships, and the question of how to assume the responsibilities of adult The Piper’s Price continues all of the best elements of The Neverland Wars with an added layer of sophistication. The plot is just as fun and engaging, and Greathouse manages to craft more nuance into the story’s themes. In this book, we continue to track Gwen’s struggle with growing up as she’s torn between her desire to stay in Neverland and her draw to the adult world. She struggles with regular issues like boys and relationships, and the question of how to assume the responsibilities of adulthood without losing something of herself in the process. This part of the story delves further into questioning exactly what defines childhood and innocence. Gwen is frozen on the border between being a lost child and a lost teenager, and whenever she returns to reality she feels the weight of her age and attraction to Jay. This seems to imply that there is a connection between innocence and a lack of sexual identity, but I suspect that there’s more to it than that. Gwen is most playful when she’s around Jay because she gets to be the ‘special’ one, not the anomaly that she is in Neverland. She becomes confident through that companionship. I hope that Gwen will realize that she can continue to be youthful even as she grows up - that it’s a state of mind, not an age, and that she doesn’t have to lose that just because she has a crush. These themes are embedded in the plot with more finesse than the first book and it's really fun to read. The writing grows up, just as Gwen is growing up as she takes responsibility for making her own choices. I still think the writing is best suited for the 13-18 age range, but adults who like YA books can read this and still enjoy it too! After dropping out of her university and beginning training as a cir Audrey Greathouse is a Seattle-based author of science-fiction and fantasy. Raised in the suburbs, she became a writer after being introduced to NaNoWriMo during her sophmore year of high school. Since then, she has drafted more than a dozen books, 100 sonnets, and 800 other poems, and a handful of short stories and one-act plays.